I picked up a white 2015 Versys 650 GT yesterday so I thought I would drop in and say "hello". I live in London and also own a slightly elderly Fireblade which, come April, will cost me £12.50 to ride into town. 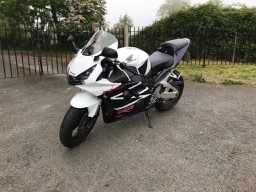 I'm not quite ready to sell the Blade so thought I would get something which would be a proper contrast, as well as being OK to take into the new Ultra Low Emissions Zone. This one has been well-used by two previous owners but seems to be in pretty good shape. 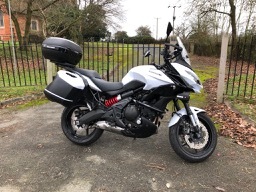 It's mostly standard apart from SW Motech crash bars, and I got the dealer to fit some new heated grips as part of the deal. - I took it for a quick blast yesterday before the weather closed in and it's pretty comfortable - the main thing that bothered me was that the brake pedal seemed to be low - felt like quite a big dip with my right foot to operate it. Is this adjustable ? - there is some kind of aftermarket sat nav bracket fitted above the dash - i'll want at some point to be able to attach a phone case using one of those RAM ball things - anyone else done similar and can recommend a good solution ? - also, is there a recommended converter for the 12v socket to be able to connect a USB cable ? - the bike has no hugger and i usually like to fit these. As the coffers are a bit depleted I was looking at some cheap Chinese options on eBay (around £30) and wondering if anyone has any experience of them ? You have bought a good bike for London, England, Scotland, Ireland and all of Europe. 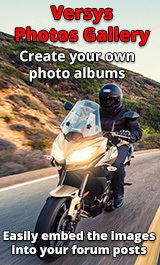 They are good bikes which with regular servicing will go for some high mileages. Headlights - get used to being told - Hey Mister you've blown a headlight bulb! Rear Brakes on the Versys are well known for not very good retardation, but I suspect yours may need some adjustment. There are a large number of 12v and usb type sockets and converters on the market - again, I may suggest the search button. You can't go wrong with the little Versys. Ultra reliable, comfortable and a jack of all trades. The brake pedal height is adjustable, but is a bit fiddly. As Dave states, yes the headlight does only light one side on dip beam. Lots of folk get really uptight about this, but it is not something that bothers me. Regarding comfort, I have found my 018 650 model even more comfy than my 2 previous Versys 1000s. I hope that you enjoy the new bike, and that it suites your needs. There is lots of help and info here if and when needed. cheers Geoff. Hello and welcome in,dont buy a Pyramid hugger,they have a habit of shattering. £12.50 to ride the blade in that there London.I thought the ULEV was only certain roads but just looked it up. £100 for lorries then 2021 it expands to the Nth and Sth Circ. FFS thats ridiculous altogether. Anyhow Welcome to the Forum. Same bike as mine, you’ll love it.